Carl Frampton is likely to be involved in a "very, very big fight" in early summer, says promoter Frank Warren. The 31-year-old Belfast featherweight has indicated he will continue his career in the ring after speculation he may retire. World title holders Leo Santa Cruz and Oscar Valdez have both expressed interest in fighting Frampton. He has already stated he will not fight before his court case with former promoter Barry McGuigan has concluded. That case is set for May, with Warren suggesting Frampton could return to the ring at "the end of May, (or) early June". Costello & Bunce podcast: Does Fury deal make Wilder rematch more or less likely? WBA champion Santa Cruz name-checked Frampton as a potential 2019 opponent on Saturday after successfully defending his belt against Rafael Rivera. "I want to fight any of the champions at featherweight or have a third fight with Carl Frampton," said the 30-year-old. "I want to be back this summer and fight three times this year against the best in the division." Frampton has continually voiced his desire for a third fight with Santa Cruz having won the first but lost the second bout against the Mexican. 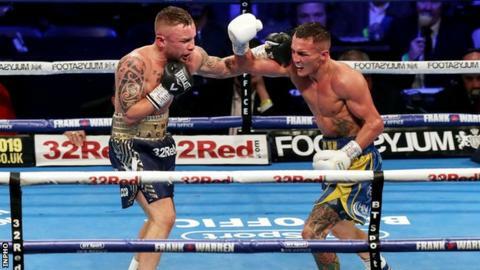 On Monday, Warren also discussed the possibility of a potential rematch with Josh Warrington, who beat Frampton in Manchester in December and will defend the title he retained in that clash against mandatory challenger Kid Galahad. "The ideal world would be for Carl to go out and win a title and then make a unification fight," he said. "Providing the two guys keep winning, I'm quite sure we could do that. "If we can make a rematch, we will see, it's there to be seen."